Even though I’m not a fan of the cooler weather, I think the pooches of Orphans of the Storm® appreciate the crisp fall air. They can actually enjoy playing and walking outside, instead of trying to hide in the shade all the time! The first doggy for today is Samba the two-year-old Pit Bull Terrier mix. 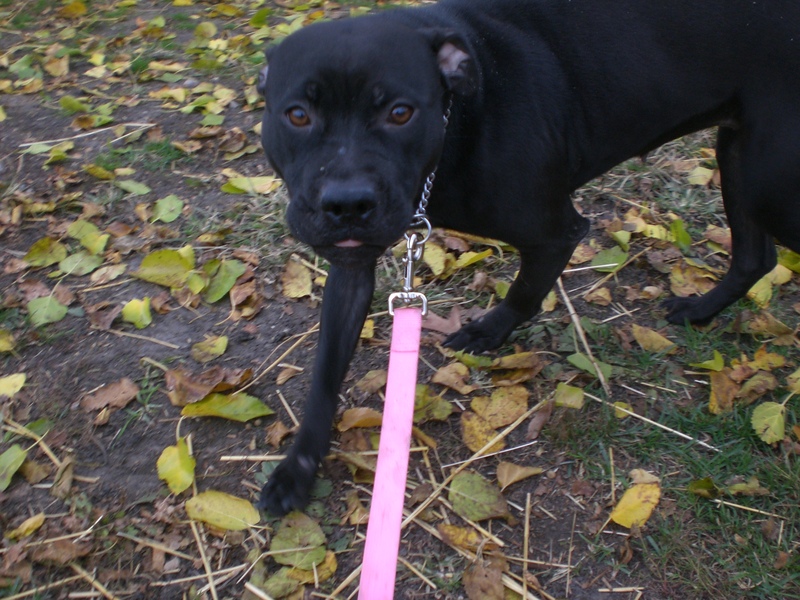 Samba is one of the most gentle Pit Bull mixes I’ve taken out at the shelter. She was a great walking buddy because she almost never pulled on the leash and was happy to walk at a normal pace, sniffing here and there. Samba has a great face. It’s hard not to smile when she looks up at you with that wrinkly forehead and those big brown eyes. Samba enjoyed getting the top of her head and her ears scratched, and gave my nose a quick doggy kiss as a thank-you. This cute, happy girl is ready for a new home! 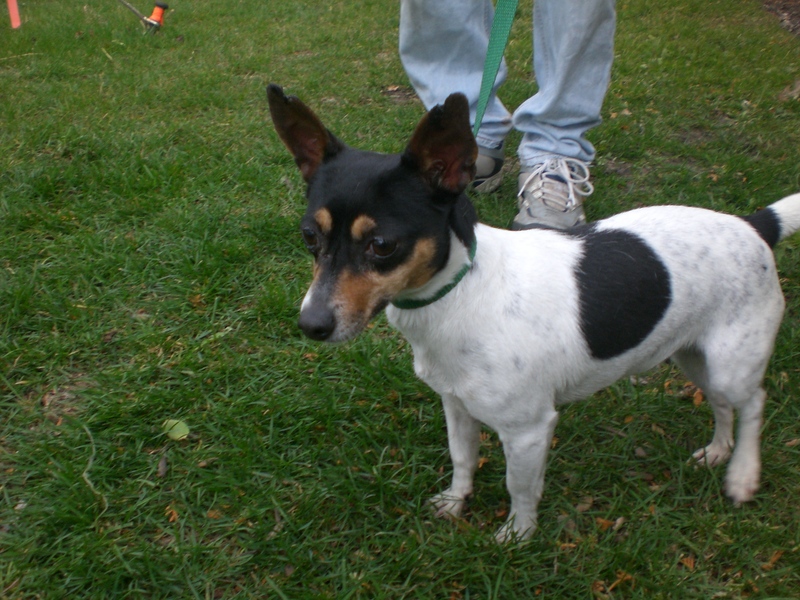 If you’re interested in a smaller dog, you should meet Quiz the six-year-old Parson Russell Terrier mix. I can’t get over how cute this little guy is. He’s friendly, happy, and lovable. 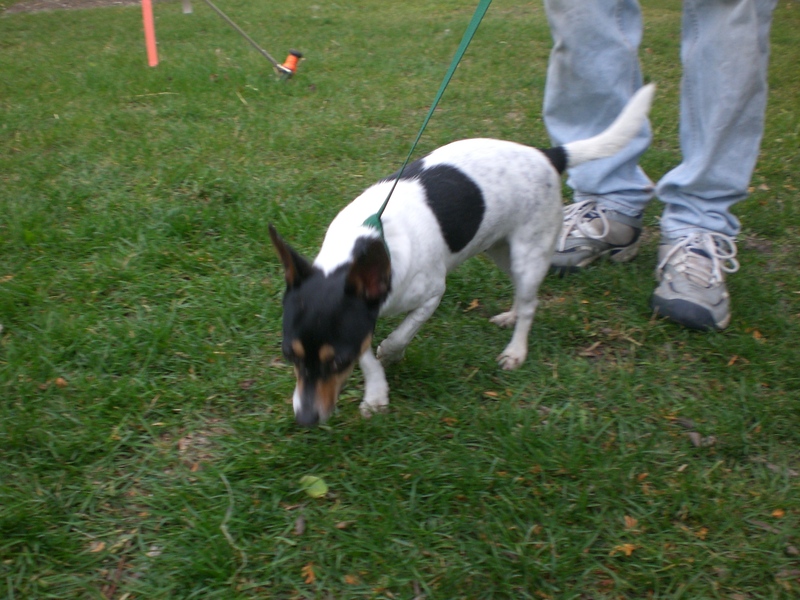 Since he’s a terrier, you know that he’ll have lots of energy and want to play. Quiz is also an easy-going pooch. He currently has two kennelmates, so he does well with other dogs. He also let me scoop him up and carry him around in my arms for a little while–no squirming or wiggling. The entire time I was out with him, I couldn’t stop saying, “You are too cute!” You’ll be saying the same when you see him! 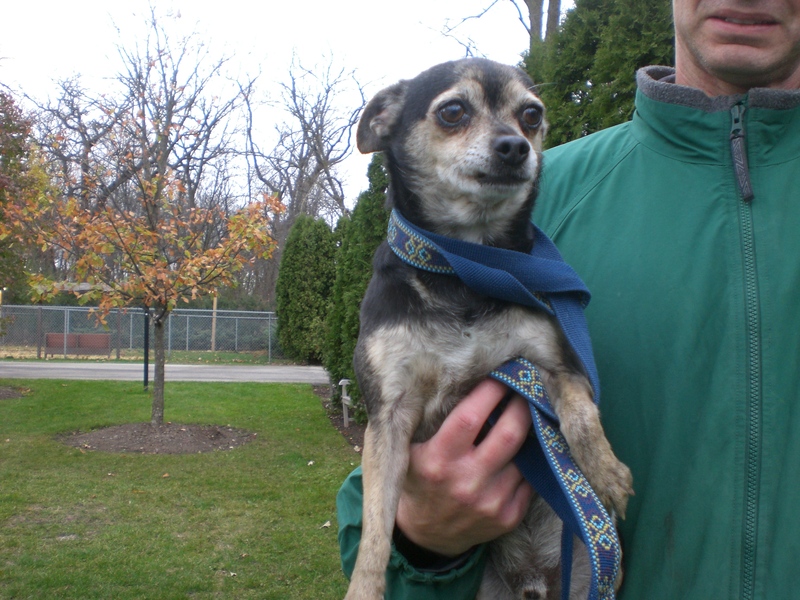 One of Quiz’s kennelmates is Hershey the nine-year-old Chihuahua mix. Craig and I both thought Hershey was a great dog (and Craig is partial to Pit Bulls, so that’s really saying something!). Like Quiz, Hershey was happy to get picked up and cuddled. This older pooch would definitely appreciate some extra snuggling with his new family. Hershey is also good at walking on the leash. He went wherever we walked without much pulling from his end, and kept his head high so he could keep track of everything that was happening around him. 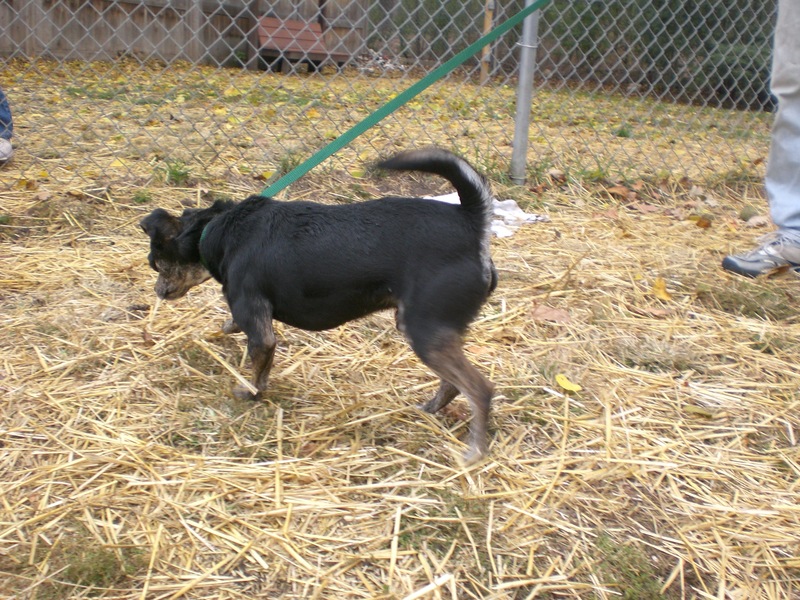 He too gets along with other dogs and can’t wait to settle in to his furever home. 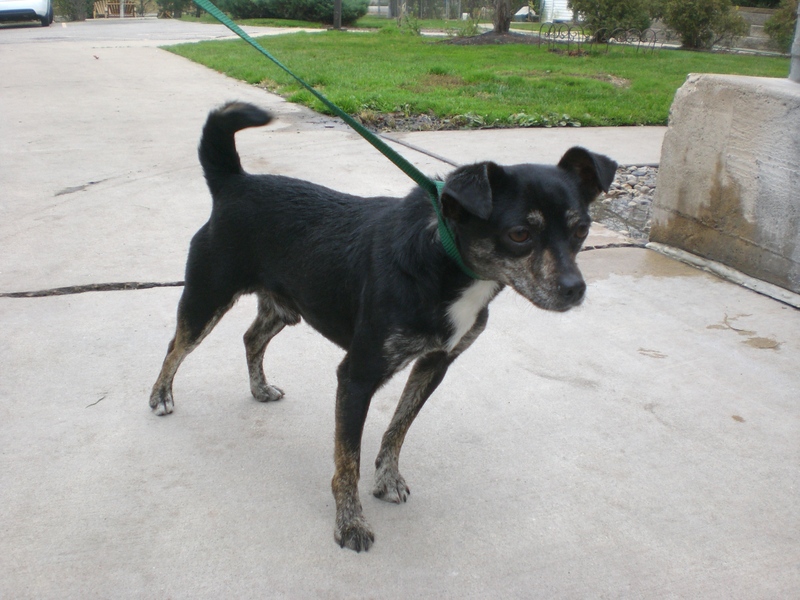 Another Chihuahua mix looking for a new home is five-year-old Tiger. I’m not quite sure how this guy got his name, since he’s much smaller than a tiger and much more cuddly. Maybe it’s his colorful paws. Tiger has a unique (and precious) look, and is larger than the average Chihuahua–but still a perfect size for someone interested in a small dog. Tiger is ready to go home with you! Tiger also has a couple kennelmates at the moment (one of which I took out with Tiger, but he was taken right out of my hands by an interested family and got adopted! Yippee! ), so he can go to a home with another dog. He would also be okay with being the center of attention, and would be great at keeping his new family happy and entertained. There are so many great dogs to choose from at Orphans of the Storm®! Who will steal your heart? 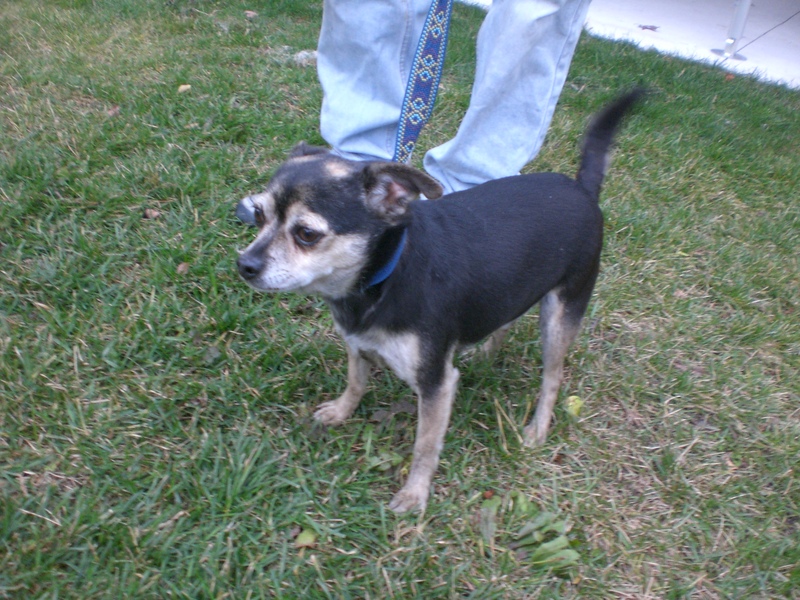 Posted by Meet the Pooches on November 8, 2012 in Dog Profiles and tagged adoption, animal shelter, Chicago, Chihuahua, dogs, Orphans of the Storm, Parson Russell Terrier, pets, Pit Bull Terrier. I’m looking for a “GENTLE GIANT” my last 3 dogs were from Orphans, last 2 were each about 100 lbs…wonderful GG’s…any suggestions? How do you feel about older dogs? Dustin the 10-year-old Black Lab (who I spent time with last weekend and am going to write about next week, if he isn’t adopted by then!) is one of my favorite dogs at the shelter right now. I can’t say enough good things about him. Chewy is another Black Lab and favorite of mine–he’s 8 years old, and is great with people but not such a fan of other dogs. There’s also a very handsome Rottweiler named Guinness, but I haven’t taken him out yet so I’m not sure if he falls into the “gentle” category or not. Don’t hesitate to call the shelter for advice! There are plenty of dogs who I haven’t had the chance to take out yet who might be a perfect fit for what you’re looking for. Thanks for reading, and good luck with your search!